A three-fifths majority of the Czech public (61 %) is dissatisfied with the Czech Republic’s membership in the European Union. Hypothetically, if a referendum on joining the European Union was held here again, 38 % of citizens would vote in favour, while 62 % would vote against. The results of the current survey indicate the lowest level of support for the union ever recorded in the many STEM surveys conducted over the years. Furthermore, a three-fifths majority of the population (58 %) currently have negative feelings towards membership in the European Union (feelings of considerable fear or moderate concern). As part of our regular monitoring of Czech public opinion on the issue of Czech membership in the European Union, STEM focused on the satisfaction of Czech citizens with EU membership. The September survey found that two-fifths (39 %) of citizens are satisfied with our membership in the EU. Thus, a feeling of dissatisfaction prevails among a three-fifths majority of the Czech population. The STEM surveys, which track the development of population satisfaction with membership in the European Union in the years following the Czech Republic’s EU accession, show a gradual decline over the years in satisfaction levels with the union. This trend was interrupted with the Czech Presidency in 2009 which led to a significant reinforcement of positive feelings. Subsequently, however, the level of satisfaction started to decline once again, falling below the 50 % mark. This year the Czech population’s level of dissatisfaction with European Union membership has risen even further, an increase which can most likely be attributed to the union’s internal problems and to the complicated process of finding a solution to the current influx of migrants to Europe. Czech citizens’ fear of refugees undoubtedly has a negative impact on the country’s relationship with the European Union, which demands solidarity among its member states in resolving the refugee crisis. Since the Czech Republic’s accession to the European Union in 2004, STEM has been exploring the hypothetical question of what would the outcome of a referendum on joining the EU be if held again. In the beginning the vast majority of Czech citizens hypothetically supported joining the union, but this majority gradually decreased until, in the spring of 2011, the proportion of votes for and against evened out entirely. Over the course of the following year, the number of respondents in favour of joining continued to fall even further. 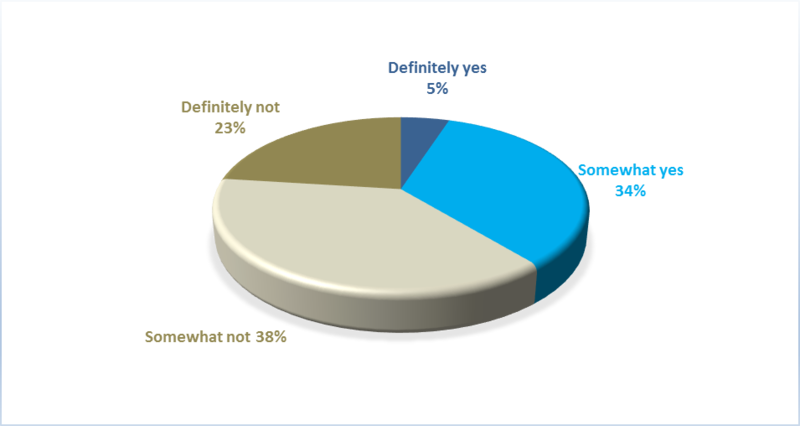 Following a period of relative stability from 2012 to 2014, the current survey shows the lowest level ever of hypothetical votes in favour of joining the European Union in the timeline covered by STEM at 38 % of the population. The following graph shows how in particular the proportion of those absolutely against the union, i.e. 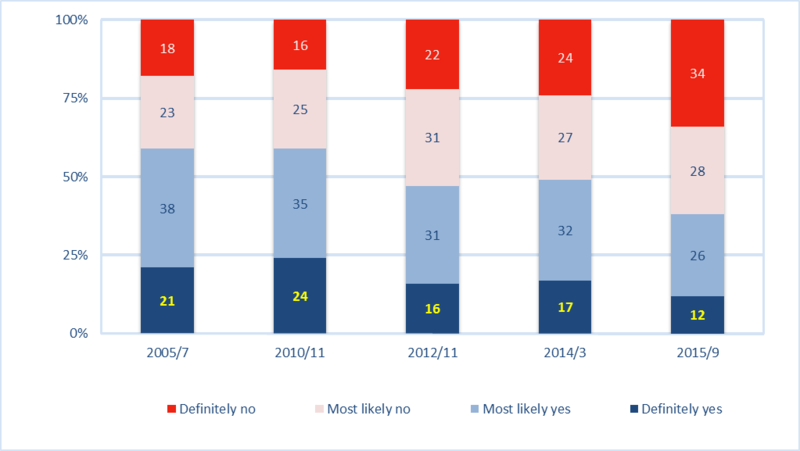 those who would definitely cast a ‘no’ vote, has increased since the previous survey in spring 2014. The low proportion of supporters of our membership in the European Union corresponds with the current low level of satisfaction with the country’s membership in the union. Specifically, this means that over half of respondents (55 %) are dissatisfied with our membership in the union and would vote no in a referendum on joining the EU if it were held again. One third of citizens (33 %) hold the opposite view, that is, they are clearly pro-union. One tenth of respondents (12 %) provide contradictory answers. On the subject of our membership in the European Union, we asked respondents an additional question designed to gauge their attitudes on an emotional level. The results confirmed the current negative mood of the majority of the Czech public in their attitude towards the European Union. Negative feelings clearly prevail. 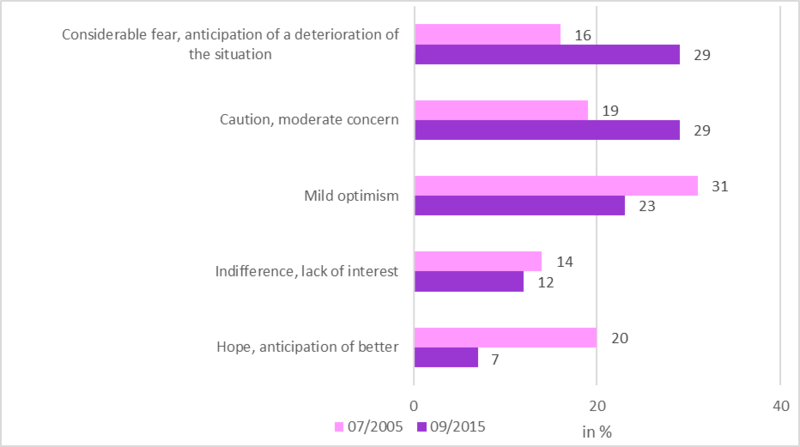 In connection with our EU membership, almost one third of respondents expresses significant fears and expects the situation to deteriorate. A further one third feels moderately concerned. By contrast, the total number of citizens who expressed positive feelings towards the union (mild optimism and anticipation of a better future) was a mere one third of the population. One tenth was neutral, expressing indifference and a lack of interest. It appears that the period of confidence in the union which we documented ten years ago is well and truly over. 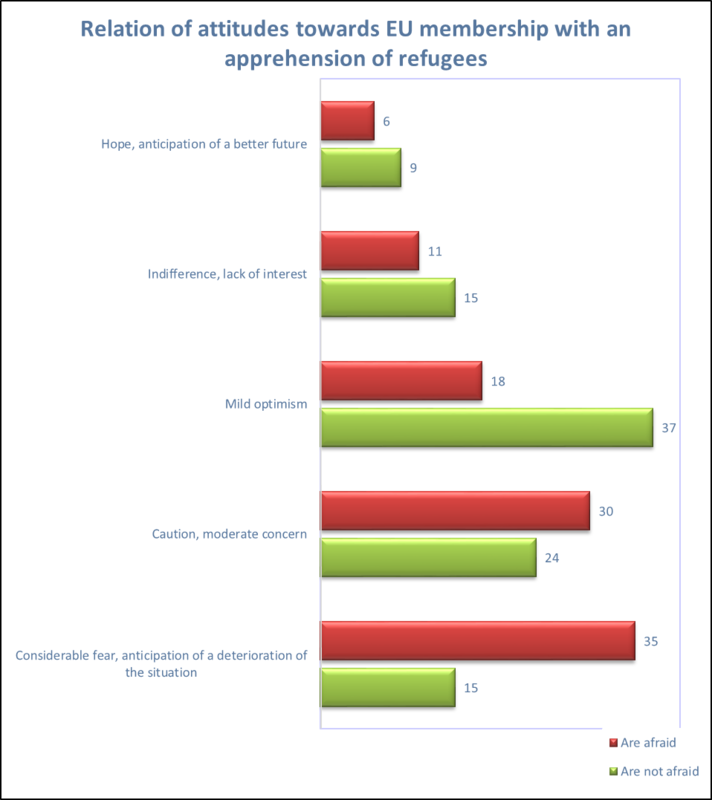 The connection between the current attitudes of the Czech public towards the European Union and the handling of finding a resolution to the problems related to the influx of migrants can be illustrated in the following graph. It is evident from the graph that those who are afraid of refugees in particular have a negative attitude towards the European Union (65 % of this group are considerably afraid or slightly concerned compared with 39 % of the group who are not afraid of refugees). Attitudes towards our membership in the European Union largely vary according to the age, education, financial security, political orientation and party affiliation of respondents. Younger people tend more frequently to be pro-European (47 % of the under 30s are satisfied with membership in the union), as do university graduates and those who are more financially secure. However, a decrease in satisfaction with our European Union membership is evident among all sociodemographic groups, most significantly, however, among secondary school and university graduates and the over 45s. In terms of political orientation, those to the right of the political spectrum, specifically TOP 09, Civic Democrat (ODS) and Christian Democrat (KDU-ČSL) supporters have a more positive attitude towards the EU. By contrast, left-wing citizens, and primarily Communist Party (KSČM) voters, are characteristically anti-European. An important finding is the considerable decline in satisfaction with EU membership among citizens who have traditionally had a more positive attitude towards the union, that is, this decline is has occurred more among the right-wing and centrist population than among left-wing voters. TOP 09, conservative party, and the liberal-conservative Civic Democrat Party Party (ODS) are the right-wing opposition parties; KDU-ČSL is the Christian Democrat party and one of junior coalition partners; ANO is centrist movement and one of the junior collation partners; ČSSD is the ruling Czech Socialist Democratic Party; KSČM abbreviation is Communist Party of Bohemia and Moravia. ← What do Czechs perceive as a threat to society?